Great drinks coaster to keep your table clean and guests amused. Why not bring them out at your next dinner party, they will be the talked about long after you are done with the dinner party. 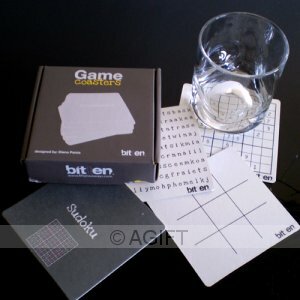 A set of 24 interesting drink coasters, with 4 of each game design - Sudoku, Hangman, Crossword, Tic Tac Toe, Word Search and Spot the Difference. Makes a great gift for birthdays, kitchen tea or house warming. Perfect business gift for a colleague or something different for a Christmas Kris Kringle.